If you live in Edinburgh and still don't know about KYLOE then you 100% must be living under a rock. KYLOE is the only gourmet steak restaurant in the city and is situated above the Huxley in the West End of Edinburgh. It has a glorious reputation for its luxurious menu and is probably best known for their Sunday Roast which definitely does not let down. The atmosphere as soon as we were welcomed was warm and relaxed as host Emma greeted us and took us up to our window side table looking over Princes Street. There's quirky little pegs you can pull down from the wall to hang your bag and jacket on to avoid the usual floor dump. After settling in we were offered starters but to be honest we were far too excited being surrounded by the smell of Roast beef around us to even think about waiting any longer to try it. So with that, we swiftly declined and chose a 2013 Cabernet Sauvignon which was a great match for the richness of the beef that was coming. Our first waitress was lovely and so knowledgeable about each wine we discussed to find the perfect taste for what we all liked and were looking for. We waited what felt like a lifetime but realistically was probably only about 25 minutes and through the restaurant came a steaming prime piece of roast beef in all it's glory. It was hand carved in front of us and we were kindly asked if it was pink enough. Naturally, it was. What followed was only what I could describe as Christmas, birthdays, New Year and every special day of the year rolled up and served in the form of the most perfectly fluffy duck fat roasted potatoes, the creamiest cabbage, just crunchy enough mix of diced carrots, parsnips and turnips which had a nutty sweet glaze too. Obviously there were Yorkshire puddings which were impressively puffy although a bit too crunchy for my personal taste (Toni and Lyndsey thoroughly enjoyed them however!). Now, please keep yourself seated for what I can only describe as one of the most luxuriously creamy and ridiculously moreish creamy, buttery horseradish sauce. So good in fact I may or may not (definitely did) have eaten it with a spoon even though I thought I was about to burst due to excessive roast potato consumption. The only thing that slightly took away from the perfectness of the meal was that it wasn't as hot as I personally would have enjoyed but I was only 1 of four who felt this so take of that what you will. After a break to decide whether we really could squeeze in dessert we without hesitation, after moaning and groaning about how full we felt and how no more food could possibly fit, we said yes to the apple strudel. We were informed it would take around twelve minutes which we welcomed and encouraged as long as a wait as possible but as soon as the waitress said there was a fresh vanilla custard I could see our eyes all lighting up. It arrived beautifully on a wooden board with two jugs of freshly made vanilla custard (Toni literally couldn't help herself but to drink it, that's how good it was). The dessert admittedly was too heavy after the roast and from what we could see around us on other tables everyone took it home in a doggy bag- including us. KYLOE's Sunday roast is definitley a contender for your Mum's roast, if not better (sorry Mum). It's traditional, rich and delicious. We enjoyed the Sunday Roast that could easily be shared between 4/5 and was a set price of £100 which includes the dessert. Any drinks and starters are additional. It's a light-hearted but warm and professional atmosphere paired with passion from each and every member of staff for what they're delivering: expect only the best. 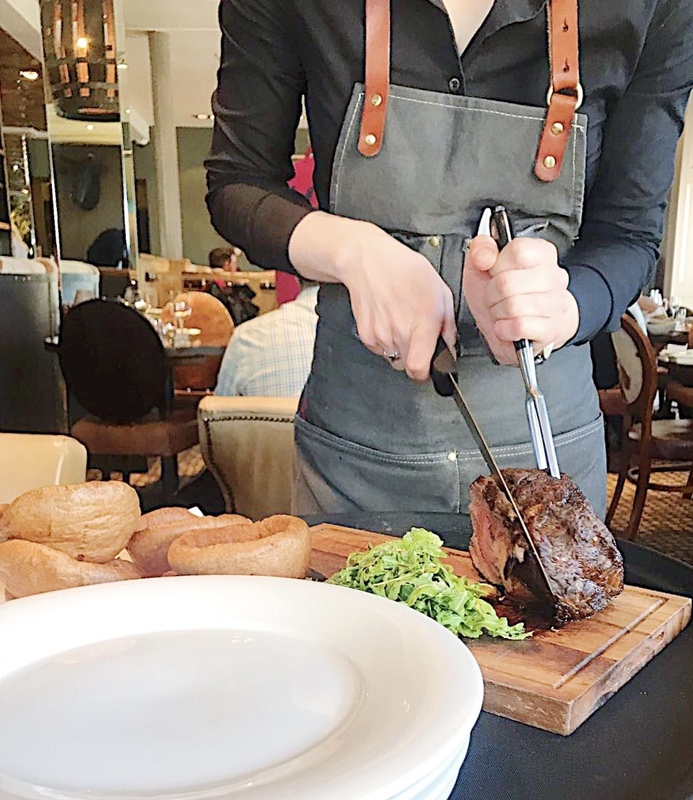 KYLOE is considered by many as a very formal environment reserved only for special occasions, but it is also an ideal atmosphere to enjoy a relaxed and casual Sunday roast. The food is exceptional and sharing the roast with friends and loved ones makes it an even better experience whether it be for a graduation, rainy Sunday's or a day visit to Edinburgh. Without realising we ended up spending the best part of the day here. Great company, a wonderful atmosphere and delicious food made the time pass effortlessly, but it was undoubtedly time well spent.